Key-date value (ft3/a) indicates the volume consumed since the key date. The key date value function stores the total volume consumed annually from key-date to key-date. This feature allows you to determine the volume consumed in the current year at any time, for example: Total consumption since the meter was installed (Normal Display): 309,560 ft3 Key-date value (through the end of last year): 300,000 ft3. This means 9,560 ft3 was consumed since the last key date. The key date indicates the date from which the volume displayed in Menu 1 was consumed. This value is saved in the key date value (factory set at: December 31, this can only be reset or changed at the factory) Default status: 00-00, will be displayed on December 31. The Instantaneous flow (ft3/h), indicates current flow. Connection: 1″ NPT internal thread; Nominal flow rate: 16; Base capacity: 60-880 CFH; pe max: 175 psig (12 bar). DE 16TN25-120B 1″ NPT internal thread 16 60-880 CFH 175 psig (12 bar) Contact Us Not available for online purchase. Connection: 1″ NPT internal thread; Nominal flow rate: 25; Base capacity: 60-880 CFH; pe max: 175 psig (12 bar). DE 25TN25-120B 1″ NPT internal thread 25 60-880 CFH 175 psig (12 bar) Contact Us Not available for online purchase. Connection: 1″ NPT internal thread; Nominal flow rate: 40; Base capacity: 75-1500 CFH; pe max: 175 psig (12 bar). DE 40TN25-120B 1″ NPT internal thread 40 75-1500 CFH 175 psig (12 bar) Contact Us Not available for online purchase. 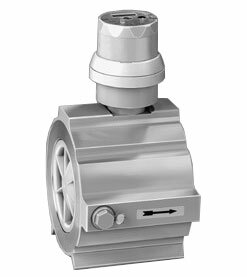 Connection: 1½″ NPT internal thread; Nominal flow rate: 40; Base capacity: 115-2300 CFH; pe max: 175 psig (12 bar). DE 40TN40-120B 1½″ NPT internal thread 40 75-1500 CFH 175 psig (12 bar) Contact Us Not available for online purchase. Connection: 2″ ANSI flanges; Nominal flow rate: 65; Base capacity: 175-3500 CFH; pe max: 175 psig (12 bar). DE 65TW50-120B 2″ ANSI flanges 65 115-2300 CFH 175 psig (12 bar) Contact Us Not available for online purchase. Connection: 3″ ANSI flanges; Nominal flow rate: 100; Base capacity: 350-5600 CFH; pe max: 175 psig (12 bar). DE 100TW80-120B 3″ ANSI flanges 100 350-5600 CFH 175 psig (12 bar) Contact Us Not available for online purchase. Connection: 3″ ANSI flanges; Nominal flow rate: 100; Base capacity: 440-8800 CFH; pe max: 175 psig (12 bar). DE 160TW80-120B 3″ ANSI flanges 160 440-8800 CFH 175 psig (12 bar) Contact Us Not available for online purchase. Connection: 4″ ANSI flanges; Nominal flow rate: 250; Base capacity: 700-14000 CFH; pe max: 175 psig (12 bar). DE 250TW100-120B 4″ ANSI flanges 250 700-14000 CFH 175 psig (12 bar) Contact Us Not available for online purchase. Connection: 4″ ANSI flanges; Nominal flow rate: 400; Base capacity: 1150-23000 CFH; pe max: 175 psig (12 bar). DE 400TW100-120B 4″ ANSI flanges 400 1150-23000 CFH 175 psig (12 bar) Contact Us Not available for online purchase. Connection: 6″ ANSI flanges; Nominal flow rate: 400; Base capacity: 1150-23000 CFH; pe max: 175 psig (12 bar). DE 400TW150-120B 6″ ANSI flanges 400 1150-23000 CFH 175 psig (12 bar) Contact Us Not available for online purchase. Connection: 6″ ANSI flanges; Nominal flow rate: 650; Base capacity: 1750-35000 CFH; pe max: 175 psig (12 bar). DE 650TW150-120B 6″ ANSI flanges 650 1750-35000 CFH 175 psig (12 bar) Contact Us Not available for online purchase. Connection: 6″ ANSI flanges; Nominal flow rate: 400; Capacity: 1150-23000 CFH; pe max: 175 psig (12 bar). Connection: 6″ ANSI flanges; Nominal flow rate: 650; Capacity: 1750-35000 CFH; pe max: 175 psig (12 bar).